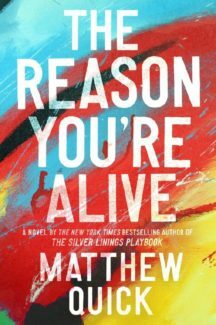 Matthew Quick’s eighth novel, The Reason You’re Alive, should be required reading for every American right now. With politics having splintered our country into “us” versus “them,” we often dismiss others because they hold differing convictions. It’s rare—and, frankly, discomfiting—to want to climb into someone else’s head and understand the basis for his or her beliefs. Yet this is what Quick demands of us in his book: he places us smack dab in the opinionated, profanity-laced mind of 68-year-old David Granger. Whether or not the reader agrees with David’s principles, he is so captivating that we gladly accompany him to the end of the novel, ultimately feeling better about our ability to come together when it matters most. David is a widowed Vietnam veteran who has crashed his car while having a seizure. The culprit is a brain tumor that David attributes to the Agent Orange he was exposed to years ago in the jungle. He comes out of anesthesia with a lot to deal with: his son’s wife has left him, his best friend Sue is getting married, and he decides it’s time to make amends with a Native American soldier he bullied during the war. The storyline that follows is funny and affecting, thanks in large part to David’s matchless voice (“I realized that maybe everyone’s family had hypocrites and liberals and assholes in it”) and his never-dull crew of family and friends. Camouflage-wearing David says of himself, “I’m a dangerous right-wing grandpa. And I own guns too. Lots of them. Some registered, some we don’t talk about.” Despite his overall petulance and ability to drop F-bombs with ease, he adds, “I may deploy colorful language from time to time, but I am not a racist, nor am I a bigot, despite what my son says about me.” And it’s true: as much as we want to assume otherwise when the book begins, David is not small-minded; it’s closer to the truth to say he has an enormous capacity to consider and then discard stereotypes. In The Reason You’re Alive—much like he did in his New York Times bestselling novel The Silver Linings Playbook, which was made into an Oscar-winning movie—Quick effortlessly dishes up dysfunctional families, mental health issues, and messy interpersonal squabbles. He tackles it all with his trademark warmth and humor, so it’s no surprise that Miramax plans to develop The Reason You’re Alive for film. But The Reason You’re Alive is not fluff. Quick ostensibly did a lot of research, because he compellingly conveys what it means to be haunted by the violence of Vietnam. David says, “I have never backed down from hard,” but at the same time, he holds the U.S. government accountable for sending him and so many other young men into a war that didn’t make sense to them once it was over. David is a fierce patriot who remains conflicted, simultaneously loving and blaming America, which produces some of the novel’s most thought-provoking moments. All told, The Reason You’re Alive goes far beyond war and touches on themes of innocence, first love, empathy, honor, and—unexpectedly—the transformative power of art. In fact, the title of the novel derives from a fictional painting by the same name; the story behind this painting and how it relates to David’s son is quite moving. Matthew Quick appears to be on a roll: he’s written eight novels in just nine years, and they are all solid. If he keeps giving us impressive and timely stories like The Reason You’re Alive, I’m already anticipating his next one.